A proper south Indian living means it is ever indispensable to have idli dosa batter at home for always!more than that the fermentation process is given more importance in our Indian diet.Lentils,rice,cereals are common inevitable raw materials for any South Indian home.Indian foods always had been giving more importance to fermented foods right from ancient times and these make the food digestible and by this way nutrients are enriched naturally. Dosas have become world-famous and most liked food around the world with more Indian stalls and restaurants selling this wonder food.If the pan is heated up too much and if you are poring the batter by this time then the batter will clump up!so use a flat-bottomed ladle and the pan should be under medium high heat when you are making dosa with even circular motions.This will give a great awesome crispy dosas. 1.Soak rice,methiseeds,bengalgram dhal,urad dhal altogether for 4 hours. 2.Then while grinding add cooked rice and grind. 3.Mix needed salt and ferment for 8-9 hours. 4.Then add needed water to the fermented batter. 5.The consistency of the batter should not be thin like aapam batter,it should be thicker than that . 6.You should be able to spread easily. 7.Heat dosa pan,when heated bring down the heat by sprinkling water and bring down the flame to medium high heat then rub clean with oil smearing cloth. 8.Then pour batter and give even circular motion and make dosa. 9.Now add oil all over. 10.When crisp turn over and fold. 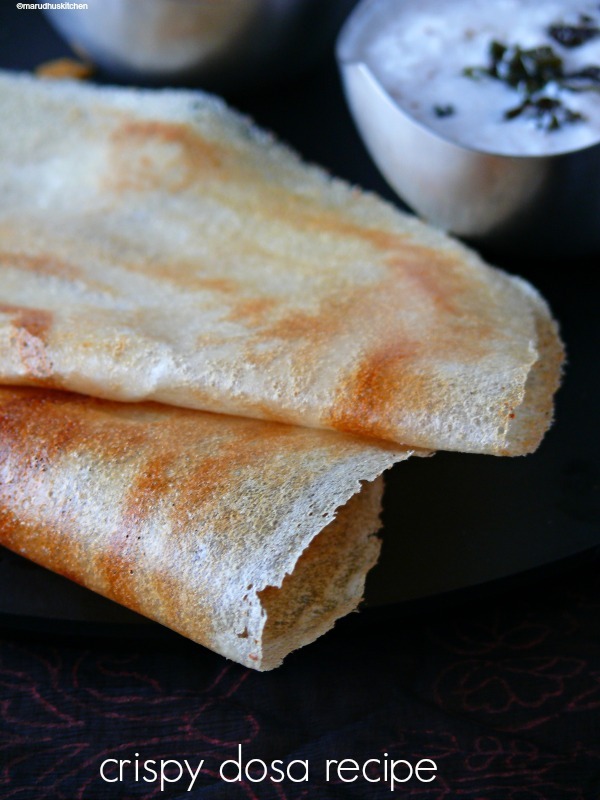 11.your crispy dosa is ready to be served with chutney and sambar. Soak rice,methiseeds,bengalgram dhal,urad dhal altogether for 4 hours. Then while grinding add cooked rice and grind. Mix needed salt and ferment for 8-9 hours. Then add needed water to the fermented batter. The consistency of the batter should not be thin like aapam batter,it should be thicker than that. You should be able to spread easily. Heat dosa pan,when heated bring down the heat by sprinkling water and bring down the flame to medium high heat then rub clean with oil smearing cloth. Then pour batter and give even circular motion and make dosa. Now add oil all over. When crisp turn over and fold. 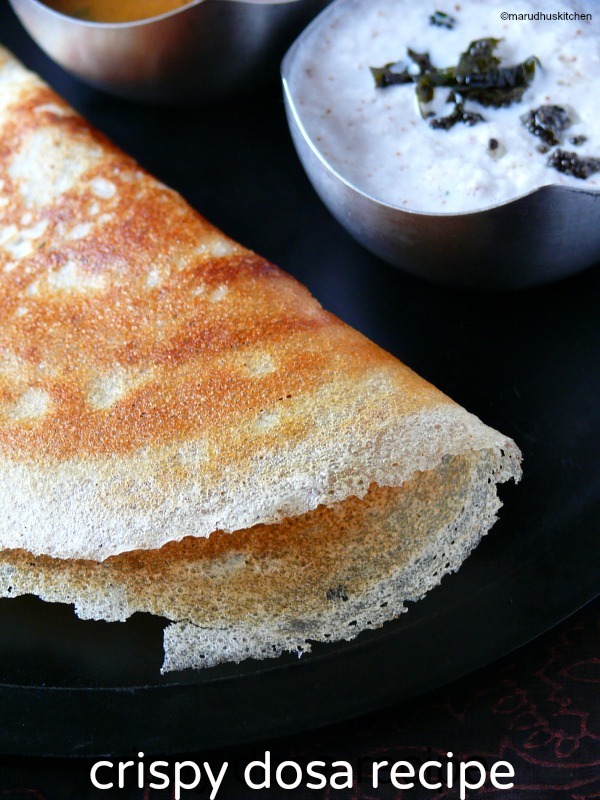 your crispy dosa is ready to be served with chutney and sambar. Before starting to pour dosa rub with a half sliced onion all over the pan so that it becomes a nice coating that your dosa will come clean without sticking. In hotels they add some sugar for taste and color but no need to add it comes out crisp without it for sure. Before pouring the batter rub the pan with oil smearing cloth and then spread the batter. If the pan is heated up too much and if you are poring the batter by this time then the batter will clump up!so use a flat bottomed ladle and the pan should be under medium high heat when you are making dosa. always love crispy dosa! very good recipe, Vani! loved the pictures. Vani, why do you have recipe ingredient listed twice? is this just the format or am I miss reading it? dear it will be easy for readers to take a printable copy..that’s the reason behind it…. Nice cruncy dosa, truly yumm. Lovely cone dosa. Perfectly crisp! thats come out so crispy..